The Kontakt Sound Library Bundle Pack pack contains “Seven great CD-ROMS” combined into one! It includes our complete Drum & Bass, Killer Keyboards, Vintage Synthesizers 1 & 2, Kings Collection, SP1200 Library and Midi Mix Collection all in one package. Available as a Digital Download for the super low price of only $100. USD. Over 3 GB of new samples with thousands of amazing sounds includes the best from our most popular sound collections. Over 100 new drum kits will have you creating killer beats in no time. Killer Keyboards, Unique Analog & Digital Synths and an all around great mix of new samples. 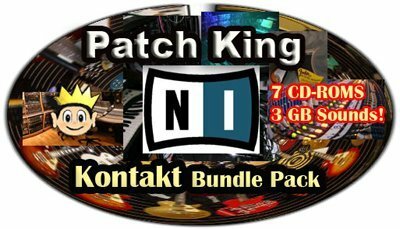 The Patch King Kontakt Bundle Pack is an amazing sound library with everything you will need for your next gig or studio session. All set up as Kontakt programs. No key mapping is needed. Just load and play! If you already own any of our Kontakt CD-ROMS you can update to the Bundle Pack for a discount rate. Please contact us for details.